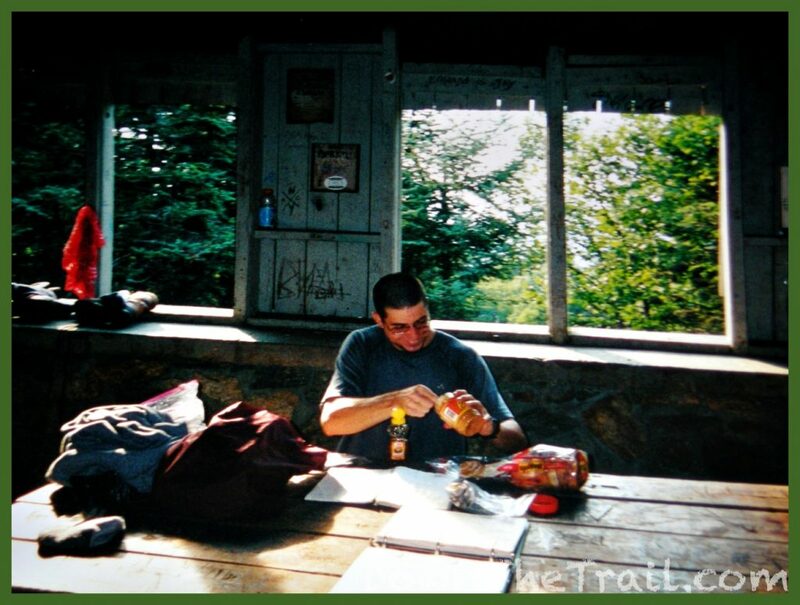 This is my original Appalachian Trail journal from 2002 (Edited for grammar). Last night I awoke to hear what I imagined was a porcupine gnawing on the wood of the shelter, but it was probably just mice. Today has been another fantastic day. I sat around the shelter with Buckeye until he moved on at about ten o’clock. He’s in thru-hiker shape, so I may never see him again. 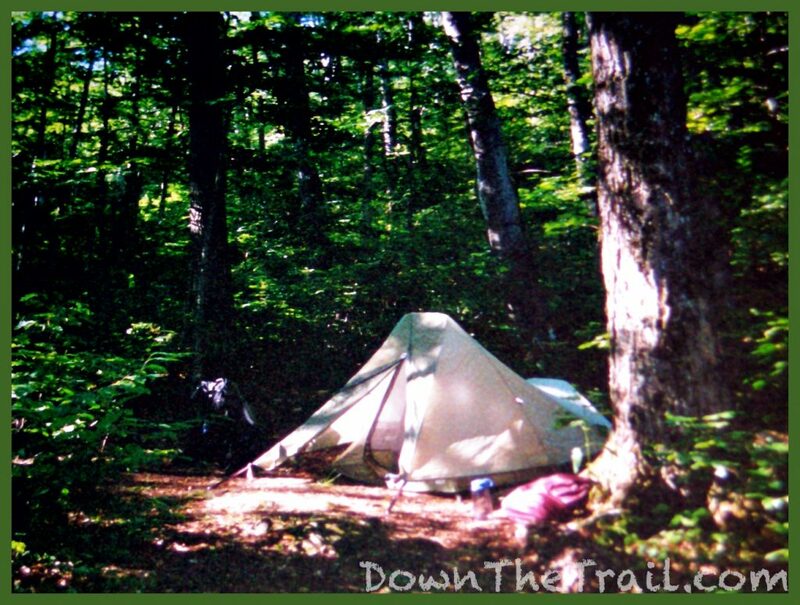 I moved out shortly thereafter and immediately had a rough time of it – ringing home the fact that I have some time ahead of me before I reach prime backpacking condition. Stopping for a break next to a stile and a scenic farm field, I met Flatlander and his son, Pyro, going south. He somehow had me confused with Baltimore Jack, a man who thru-hikes consecutively every year! We had a pleasant conversation and he left me with a hint about a mysterious stream of soda up ahead. Sure enough, in a little while I came upon a small stream with four cans of Dr. Thunder (Generic Dr. Pepper) sitting in it, with a register box nearby to leave a kind word to the trail angel who was responsible for it. As I was resting and enjoying the sugary goodness, a southbounder came along. We had a nice chat about good beer, diners in PA, and a hot female ridgerunner who I could look forward to meeting in a mile or so. After about ten minutes I continued north, and he went south on his way. A little while later I came to an awesome rocky stream that I just had to stop at. There I bathed, rinsed my bandana and shirt, and just totally rejoiced in the fact that I was bathing in a Vermont mountain stream on a sunny afternoon. After some sugar-and-caffeine-fueled hiking in my refreshingly wet clothes, I passed the dilapidated Governor Clement shelter. It was littered with empty bottles of beer. I chose to forego filling my water here, and instead went right ahead and pushed up to the top of Killington. That turned out to be a foolish idea – I became extremely exhausted, extremely quickly. Just as I was becoming quite dehydrated and hit a low mood, I came to a wonderfully cold little spring. I sat and chugged two liters of water right away, and filled up with enough to see me through the night. The remainder of the hike to the summit seemed lengthy, but it progressed easily enough. I am now inside a shelter with four walls for the night. Sharing the shelter with me is a young couple from Connecticut, hiking to Bennington VT, and a mother/daughter pair, up here only for the night it seems. I am the “pro” hiker among the group. I viewed the sunset from the summit and it was fantastic! And wow, it was a steep quarter mile to get up there! 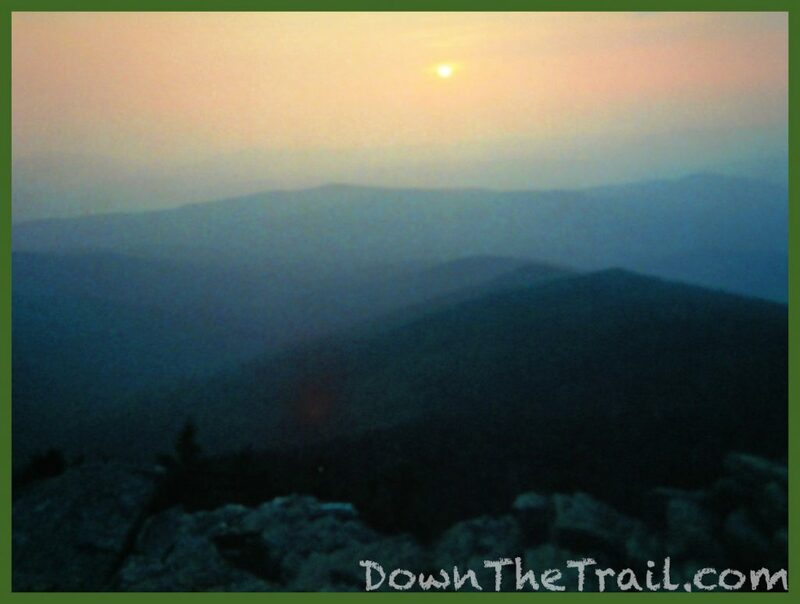 If only my family and friends back at home could see me now – there is no way to explain to “outsiders” how truly perfect life on the AT really is. Off to civilized satiation in the form of a shower, hot food, and Guinness tomorrow. Goodnight. Life is great. I was the last hiker out of the shelter again this morning at around nine o’clock. 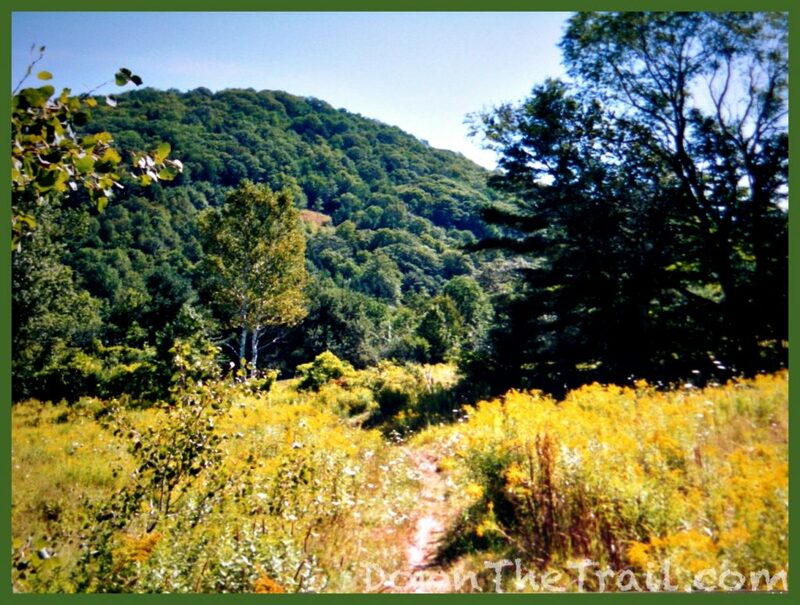 The terrain today was mostly a breezy descent to US4 and the Inn at the Long Trail. 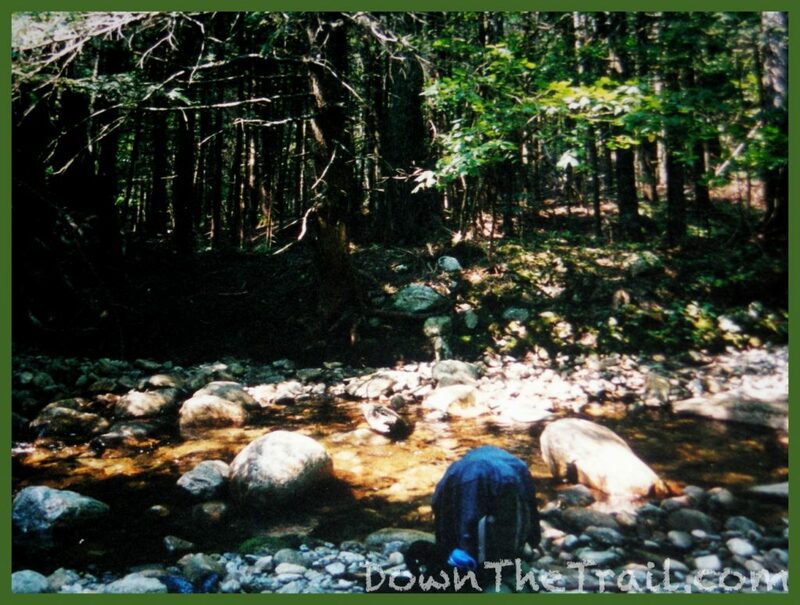 I followed the official AT down to the road – there is a blue-blazed “shortcut” trail that goes directly to the inn. The trail was recently relocated, so the official AT now reaches the road one mile away from the inn. There was a magnificent stand of white birch trees along the trail, and that’s really the only significant thing to tell about my walking today. Also I lied to a few day hikers today and told them I had come all the way from Georgia this year… sometimes it’s just a hassle to explain to folks who I’ll probably never see again about how I started last year and am finishing up this year. Vermont has cheap public transportation called “The Bus” virtually all through the state, so I caught a ride on it to town after checking in to a room. My errands consisted of checking the outfitter (Which was closed), hitting up a soda machine, hitting up Burger King, resupply at the grocery store, then hitting a gas station for another soda, and I was good to go. I struck up a conversation with the bus driver on the way back – he moved up here after retiring from General Motors in Pittsburg. “What do you do?” he asked me… insinuating that I don’t do much at all… whatever. Back at the inn I did laundry, organized groceries, took a shower, called home, sat at the bar for four hours, and here I am now in my very own room. Guinness and Long Trail Ales are tasty. I had two cheeseburgers with my beer over good conversation with some new hikers I met – Skeeter(thru), Hiep(thru), Cincinatti Kid(section), Mike(finished LT today), Shutterbug(thru), and a girl from way up in northeast Vermont (I learned that locals call that part of the state the “Northeast Kingdom”). Good people, great conversation. I have to get to sleep because breakfast is served here at 8am. Life is good. Only 469 miles to go! 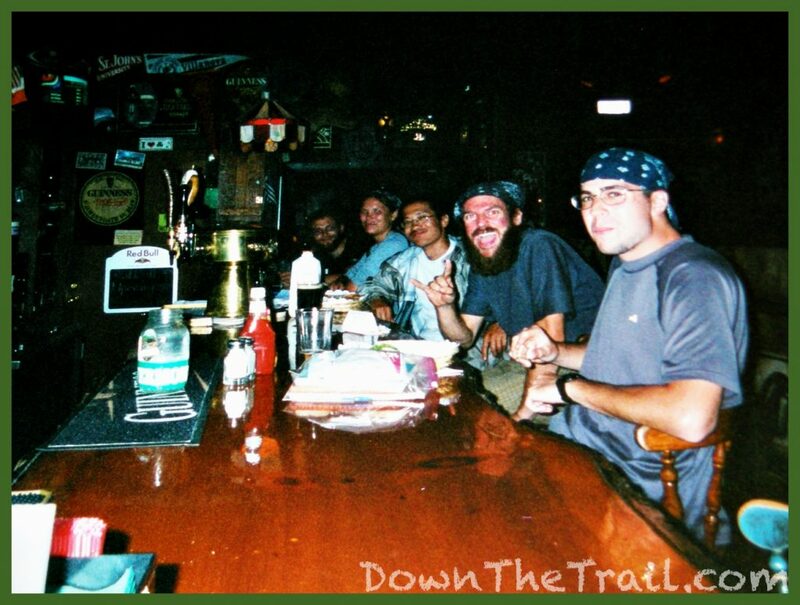 McGrath’s Irish Pub – Skeeter is to my right, followed by Hiep, girl from the northeast kingdom, and Shutterbug. I began the day with a wonderful breakfast of pancakes, bacon, and coffee at the inn. Most of the people from the bar last night were there. It was great to have some company and do the “hiker breakfast” again – I’m really feeling at home with these northbounders now. There was a huge boulder serving as a piece of the wall in the dining room – the inn is built into the hillside – I thought that was really cool. At breakfast we parted ways with Hiep, at least for a little while. He is a crazy fast hiker. 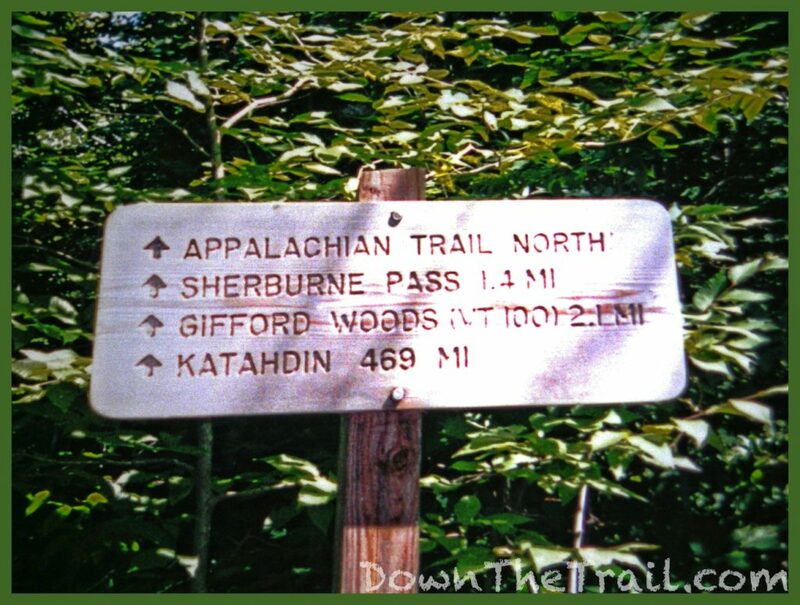 While he’s here, for example, he figures he ought to continue north on the Long Trail as a sort of side trip, and come back here to pick up the AT again in about a week or less. It rained overnight and gradually dawned into a perfectly beautiful day today. The forest was still soaking wet at about 9:30 when I hiked out from the inn, and the rising sun was causing steam to rise from everything. 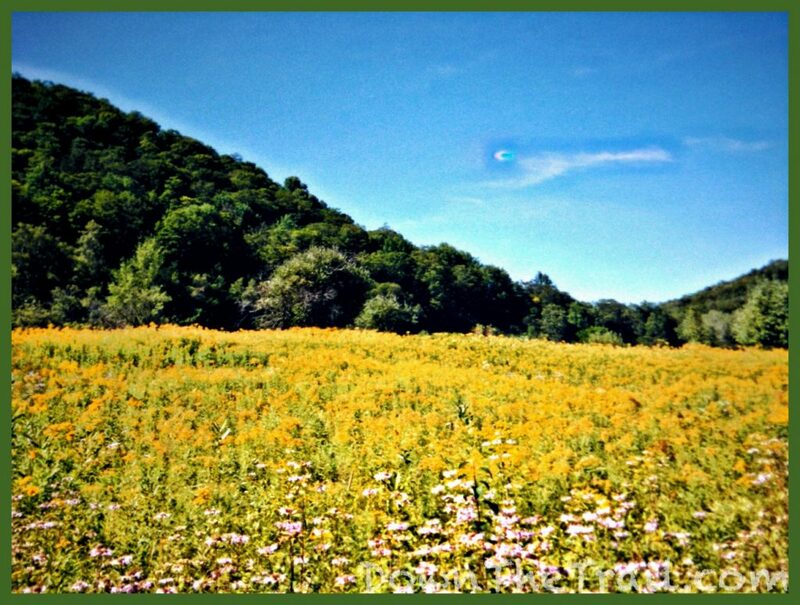 Shutterbug caught up with me long before noon, and we ended up hiking together the whole day at a good, steady pace. It felt good to simply push the body to work hard after a top-notch breakfast on a nice summer day in Vermont. The sitting around at creeks and bridges and mountaintops after some hard hiking is one of the things I missed most, and I got plenty of that today. Just hiking with somebody step for step to Katahdin felt great. Now I’m here in front of a fire at about 8:30 at the shelter with five mostly older women – two southbound thru hikers and three section hikers from Maine. As I ate my dinner the one mother/daughter pair were playing the card game “War!” It’s been ages since I played that. Shutterbug pushed on ahead for the night. Got my day started kind of late, mostly because of the long miles yesterday. I had lunch inside of a sweet hostel that’s really a converted barn, and descended into and back out of a handful of some of the most beautiful, picturesque valleys with fields of yellow wildflowers. Tonight I’m at Thistle Hill Shelter with the Desert Rats, an older thru hiking couple from the southwest, and the Maine section hikers from last night. Tomorrow I’ll be in Hanover, New Hampshire! Life is good. In the morning I didn’t get up and going until 10am, and everybody was gone. 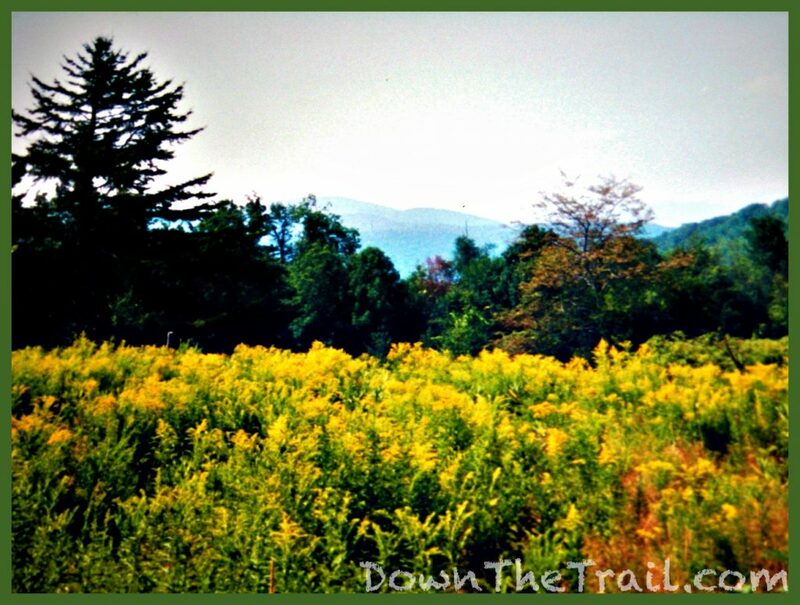 It was an easy hike down to West Hartford, Vermont – a very small town where the trail goes down the street for a quarter mile or so. Along the road there was a cool-looking iron bridge and a general store, where I helped myself to two cheeseburgers and three cans of coke for lunch out on the porch. The sky was dark and cloudy and ominously rainy looking, so I pushed on for the rest of the afternoon. The hiking was fairly easy and it didn’t start raining until later than I thought it would. When the rain arrived I actually enjoyed it, most likely because I knew I’d be dry and in town tonight. So I walked along having a good ol’ time, singing the Springsteen song “Mary’s Place” to myself (The chorus goes “let it rain let it rain let it rain let it rain”). 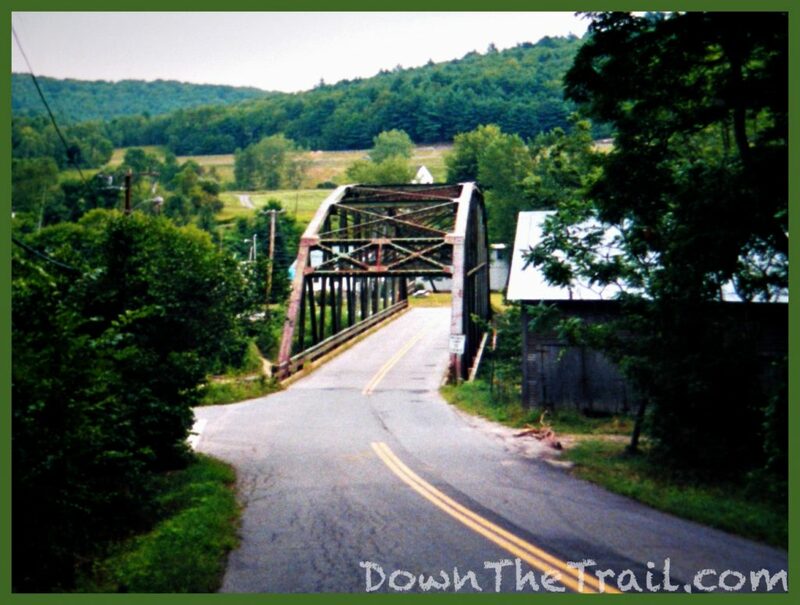 After following the trail down a series of roads I crossed a bridge over the Connecticut River and into New Hampshire. In Hanover at Dartmouth College I got directions to the Panarchy House, a fraternity that lets hikers stay overnight, described as a large white house on School Street. I found a house matching the description and rang the bell. After a few minutes an attractive young girl came to the door. “No,” she laughed, “But I think the Panarchy House is,” pointing down the street. 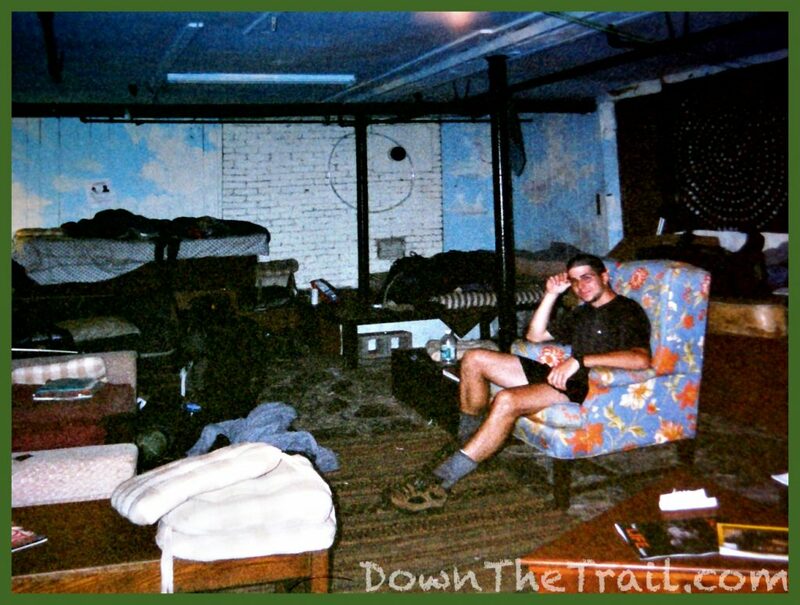 The Panarchy House is actually an old mansion, formerly the Dartmouth College President’s house. Inside the basement (Where the hikers stay) I met up with Cincinatti Kid, who it turns out was about two hours ahead of me all day. I took a shower and later met some other hikers who are staying here – Hollywood, Super Dave, and Buckeye! Tonight I went and got some food with Buckeye at a college pizza joint, spent an hour or two at the library doing email, and basically went back to the house for the night. Life is good.